Monday – Thursday: 10:00 a.m. – 7:00 p.m. Easily and securely access your medical information with our Patient Portal! Visit our Online Guide to Sports Medicine to learn about sports injury treatment, prevention tips, recommendations for improving athletic performance, and new procedures. “Like” our Facebook page to keep up on the latest practice news and events. We offer appointments for MRI scans after hours at our Bradley location. We have four locations conveniently located throughout the region in Bradley, Frankfort, New Lenox, and Watseka. As the region’s most preferred orthopedic practice, our doctors and staff provide compassionate, specialized care to Bradley, Frankfort, New Lenox, Watseka, and the surrounding communities to return you to your active lifestyle and help you redefine living. 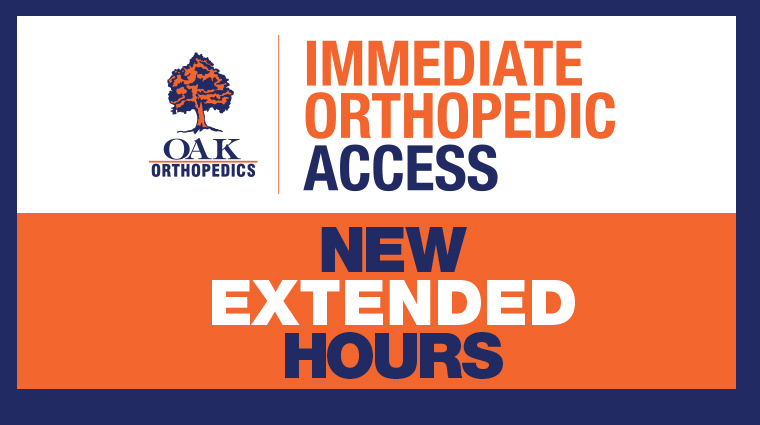 Our specialty-trained doctors of OAK Orthopedics provide treatment for orthopedic injuries and conditions affecting the ankle, back, elbow, foot, hand, hip, knee, neck, shoulder, spine, and wrist as well as joint replacement & revision, orthopedic trauma, pain management, pediatric orthopedics, podiatry, and sports medicine. Our world-class team of orthopedic experts is devoted to providing customized treatment plans focused on your needs and goals. At OAK Orthopedics, we specialize in what moves you. Join Our Donation Drive for Local Animal Shelters!